SAN BERNARDINO – Assemblymember Cheryl R. Brown (D-San Bernardino), chair of the Assembly Select Committee on Small Business Financing and Development Opportunities, will host a free Business Summit and Expo featuring expert research economist Dr. John Husing in partnership with the Inland Empire Economic Partnership (IEEP) and the Inland Empire Small Business Financial Development Corporation (IESBFDC) on Friday, May 17 at the Inland Regional Center in San Bernardino from 8:00 a.m. to 1:00 p.m. The event will feature various panel discussions and offer networking opportunities for Inland Empire business owners. Keynote speaker Dr. Husing, an expert analyst in Southern California’s growing economy, will give an address on regional economic trends for San Bernardino County. Managing your business credit, financial services solutions and creative marketing will be some of the topics under discussion at the event. Participating banks include Wells Fargo, Citizen’s Business Bank, Community Bank, and Union Bank of California. Among other guest speakers include Greg Devereaux, CEO, San Bernardino County, Vincent McCoy, executive director, California Small Business Development Center, Carla Ulloa, loan specialist, Community Development Corporation, and more. “The goal of this event is to inform business owners, especially small business owners, of the opportunities that are available to them to assist in their growth. There are funding opportunities that small business owners should be aware of; I strongly encourage Inland Empire business owners to attend this event,” concluded Asssemblymember Brown. This year’s event is proudly sponsored by the Inland Empire Women’s Business Center, the California Small Business Development Center and Minority Lead Coalition. Vendor opportunities are available. Please RSVP by Friday, May 10, space is limited. Contact Lisa Blacksher by email lisa.blacksher@asm.ca.gov or telephone (909) 381-3238 for more information. Assemblymember Cheryl R. Brown represents the 47th Assembly District, which includes Colton, Fontana, Grand Terrace, Rialto, the southwest parts of San Bernardino, and the unincorporated communities of Bloomington and Muscoy. Website of Assemblymember Cheryl R. Brown: http://www.asmdc.org/members/a47/. 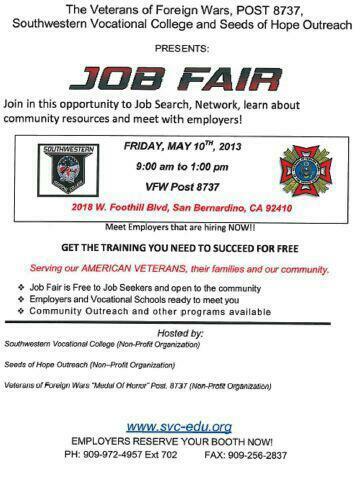 Coming this May is another Job Fair to help the under and un-employed. Bring your resumes and sharp dressed clothes and come out and meet with employers that are looking for employees. Employers and Community Resources we still have space open please email Davidsmarketing@aol.com for the vendor info packet. Join Assembly member Cheryl Brown, Supervisor Josie Gonzales and employers like Child Care Careers. A bill that seeks to protect access to financing for manufactured homeowners, AB 379, passed out of the Assembly Floor with a bi-partisan vote of 75 to 0 and is headed to the Senate. Manufactured homes (i.e. mobile homes), unlike traditional homes, must be built on a permanent chassis and have the ability to move to different locations. This creates an issue of whether manufactured homes are considered chattel (i.e. personal property such as a car) or real property (i.e. unmovable property such as a building). For most lenders, manufactured homes are considered chattel, which can limit financing options for homeowners. Currently, companies that offer financing for manufactured homes maintain a security interest until the home is paid off. Without this protection, consumers would have few, if any financial options. AB 379 would allow a manufactured home to be “converted” into real property, ultimately protecting financing options for consumers purchasing a manufactured home. AB 379 was inspired by a recent court case, Vieira Enterprises v. City of East Palo Alto. Vieira Enterprises filed a lawsuit against its property owner for failing to pay fees associated with the delivery and installation of two manufactured homes on real property. The Court of Appeals ruled in opposition of Vieira Enterprises, citing that the company had no security interest in the homes because the homes were considered real property. This ruling allowed the borrower to forgo paying the balance of the home. Further, the ruling discouraged lending efforts to consumers interested in purchasing manufactured homes. By allowing manufactured homes to be converted into real property, AB 379 removes the legal ambiguity that resulted from the Vieira case and helps ensure that loans to consumers who purchase manufactured homes will continue to occur. SACRAMENTO – Assemblymember Cheryl R. Brown (D-San Bernardino) has been appointed by Speaker John A. Pérez (D-Los Angeles) to chair the Assembly Select Committee on Small Business Financing and Development Opportunities for the 2013-2014 session. The committee will focus on helping small businesses and creating an environment for small business growth in the state. With a background as a small business owner, Assemblymember Brown will draw upon her experiences to tailor legislation that will improve access to credit and technical services for small businesses owners. “I’m looking forward to working with my colleagues and serving the needs of the small business community. Small businesses are so important because they provide a majority jobs in our district and play a vital role in boosting our economy,” concluded Assemblymember Brown. Additional members appointed by Speaker Pérez include Assemblymembers Raul Bocanegra, Rob Bonta, Susan Talamantes-Eggman, Chris R. Holden, Eric Linder, Brian Nestande, and Marie Waldron. The committee will work closely with small business owners and hold public hearings to discuss business related problems and solutions. SACRAMENTO – Assemblymember Cheryl R. Brown (D-San Bernardino) issued the following statement today regarding her support of AB 113, a bill to increase the appropriation for the Secretary of State by $2 million to address the business filing backlog. “In support of my goal to push policies that assist small business development and growth, I voted in support of AB 113, a bill that appropriates $2 million of business filing fees to the Secretary of State, and requires that the increase only be used to reduce the time it takes to process business filings for those who want to start a business in California. In the past, the process to file the appropriate business documents and fees in California would take 20 days. Currently, budget cuts and under-staffed departments pushed processing times to 85 days. As a result, businesses cannot hire employees, begin paying entity taxes or officially open their doors for two months. Assemblymember Cheryl R. Brown (D-San Bernardino) voices small business concerns during JEDE Committee Hearing. 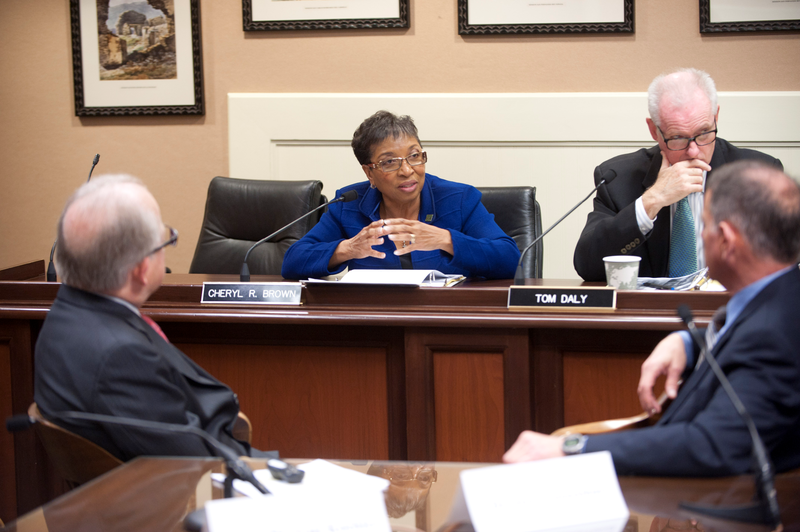 SACRAMENTO – Assemblymember Cheryl R. Brown (D-San Bernardino) joined committee members for a hearing of the Jobs and Economic Development & the Economy (JEDE) Committee on Tuesday, February 5. JEDE is the policy committee in the State Assembly responsible for reviewing policies and legislation related to small business development, international trade and other economic development related issues. The JEDE Committee includes Assemblymember Jose Medina, chair, Assemblymember Travis Allen, vice-chair, and Assemblymembers Tom Daly, Paul Fong, Steve Fox, Ben Hueso, Eric Linder, Melissa A. Melendrez, and V. Manuel Pérez. Assemblymember Ken Cooley also joined the members of the JEDE Committee for the hearing. JEDE is currently tackling the state’s economy and unemployment figures by seeking job creation opportunities. During the hearing, Assemblymember Brown spoke about the importance of supporting small businesses and jobs in the Inland Empire and she indicated there are impediments to businesses. “I’m glad I had the opportunity to voice concerns on behalf of the small business community in the 47th District during the hearing. Supporting small business is so important to me because small businesses provide a majority of jobs in our district. Small businesses are hurting right now and many of them are closing their doors. We need to help our small businesses by updating and streamlining some of the state’s regulatory processes,” said Assemblymember Brown. Assemblymember Brown said she plans to support the JEDE Committee as they look for ways to improve our state’s economy. For more information, contact (909) 381-3238. Assemblymember Cheryl R. Brown (D-San Bernardino) has been appointed by Speaker John A. Pérez (D-Los Angeles) to the following Standing Committees for the 2013-2014 Legislative Session: Rules; Housing and Community Development; Arts, Entertainment, Sports, Tourism, and Internet Media; Veterans Affairs; and Aging and Long-Term Care. Assemblymember Brown represents the 47th Assembly District, which includes San Bernardino, Rialto, Colton, Bloomington, Fontana, Muscoy, and Grand Terrace. Assemblywoman Brown was elected on November 6, 2012.